“Eko” by Loren Walker is the first book of NINE, a sci-fi/action-adventure series following multiple perspectives. Sydel is a young healer in the Jala Communia with mysterious psychic powers. After treating a stranger from outside the community, she is cast out and begins to travel with the stranger’s family while developing her powers. This novel’s biggest strength is its plot. The adventure takes the reader on an action-packed ride throughout a scientifically superior world packed with a teeming criminal underground, corrupt upper-class, and strange psychic powers. Its only fault is the pacing. There are some time jumps that feel forced and pushes the plotline forward too quickly. Another strength comes from the scientific side of the story. Computer hacking plays a pivotal part in the story and the characters sound as if they know what they are talking about. They explain it to the reader in a simple-to-follow manner. Too often in science fiction the science does seem comically unrealistic or too complicated for the average reader to understand. 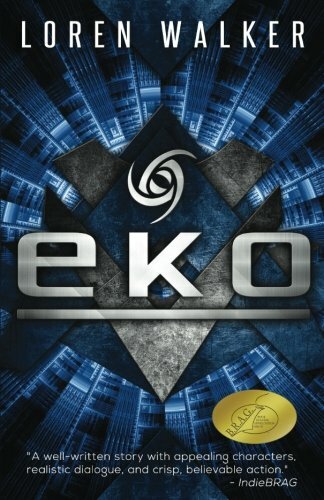 Being the first novel in a science fiction series, “Eko” has a difficult task. It must establish the story world and provide an enticing plot the reader can commit to for several more books. In this case, Walker’s attention to the plot causes the world-building to suffer. Aside from a few vague descriptions of setting and a piece or two of history, the reader is given little information. Fortunately, the plot is interesting enough to keep the reader engaged and Walker has the rest of the series to improve on the world. “Eko” by Loren Walker is a fine start to a new series. It has time to build on its weaker aspects, with enough strong ones to make the reader pick up the following books. This first book promises to feed both young adult and adult readers’ interest in computer science, and the rest of the series is sure to be action-packed.